International Visit to Boost Badminton – Barbados Olympic Association Inc.
Bridgetown, April 15, 2013 – The Barbados Olympic Association (BOA) sat down with two members of the Badminton World Federation (BWF) on Friday, April 12, to discuss the development of the sport across the region. 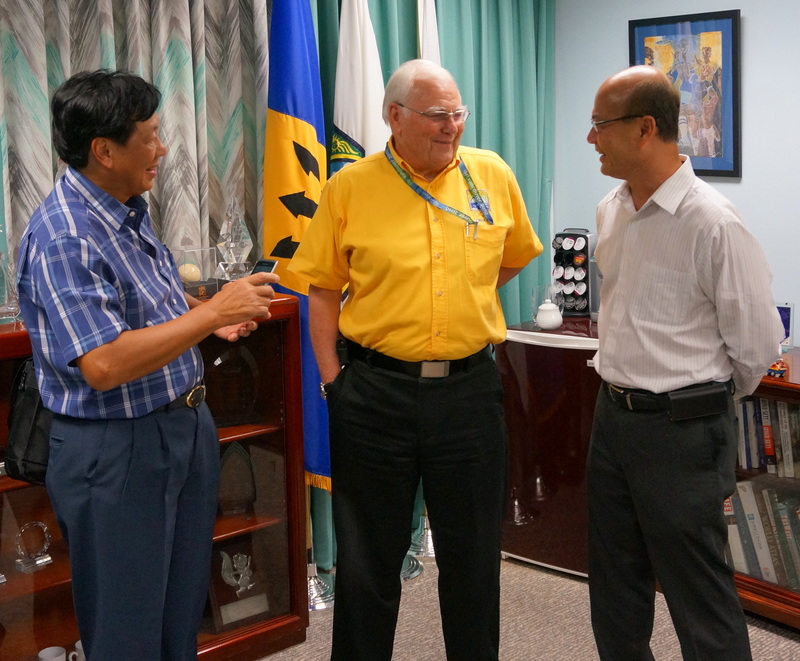 The informal visit took place in advance of the scheduled meeting with the Caribbean Regional Badminton Confederation (CAREBACO) held on Saturday, April 13. 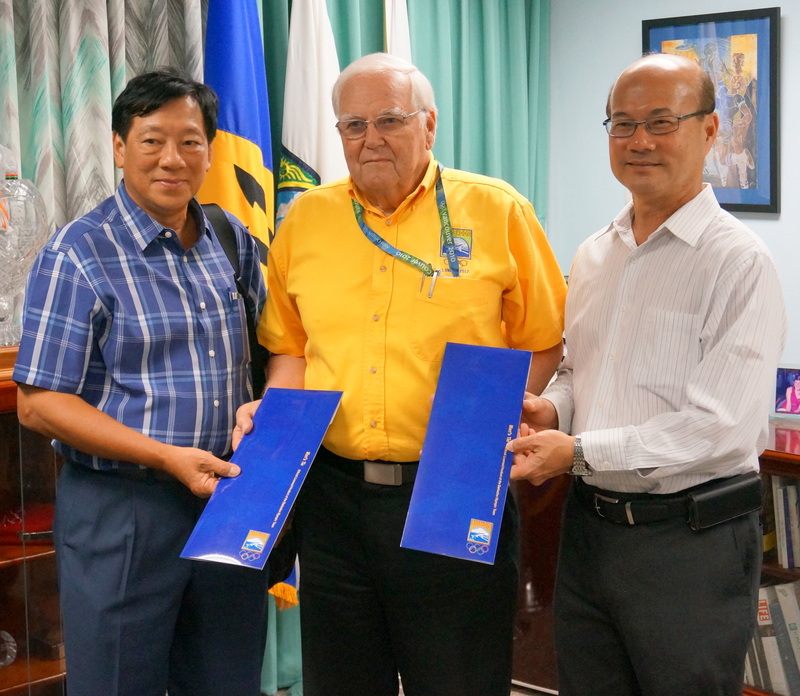 President of the BOA, Steve Stoute, welcomed Deputy President of the BWF, Paisan Rangsikitpho, and BWF Council Member, Justian Suhandinata, to Barbados and thanked them for their support of badminton, an Olympic sport since 1992. Also in attendance at the meeting were, Secretary General of the BOA, Erskine Simmons, President of the Barbados Badminton Association (BBA), Kevin Wood, and Secretary of the BBA, Mervyn Gordon. Discussions centred on Rangsikitphos campaign for Presidency of the BWF and the need for increased funding and training expertise in the smaller territories. The number one priority for any President of the BWF is to maintain badminton as an Olympic sport. To accomplish this, it is imperative that more attention be paid to smaller countries. We have just come from Guam and from here we travel to Taipei. All of these territories are facing similar challenges and it is time that the BWF enhance their efforts. If I am successful with my candidacy for President, this will be my mandate, says Rangsikitpho. Stoute thanked Rangsikitpho and Suhandinata for making time to visit Barbados and pledged the support of the BOA as they continue their campaign. Image 1: (From left) Kevin Wood, President of the BBA, Erskine Simmons, Secretary General of the BOA, Paisan Rangsikitpho, Deputy President of the BWF, Steve Stoute, President of the BOA, Justian Suhandinata, BWF Council Member and Mervyn Gordon, Secretary of the BBA. Image 2: Steve Stoute, President of the BOA (centre), making a special presentation to Paisan Rangsikitpho, Deputy President of the BWF, and Justian Suhandinata, BWF Council Member. Image 3: Steve Stoute, President of the BOA (centre), sharing a light moment with Paisan Rangsikitpho, Deputy President of the BWF, and Justian Suhandinata, BWF Council Member.